Colony Cove is "The best kept secret in the US Virgin Islands!" Colony Cove's beautiful grounds and pool are just steps from the beach. "The best kept secret in the US Virgin Islands!" says a recent guest (and reviewer), and that describes the friendly intimacy of this small resort with big-hotel amenities and activities. Limited time special: 20% OFF Selected Rooms and Dates. See our Colony Cove Rates page. Our luxury two-bedroom suites have lots of room for families or close friends who vacation together. With 60 family-friendly suites located within yards of the beach, this premier St Croix resort is just minutes from Christiansted, and on the same beach as Club St. Croix. Our guests enjoy the new free-form freshwater pool, adjacent bar and restaurant, and scheduled maid service. 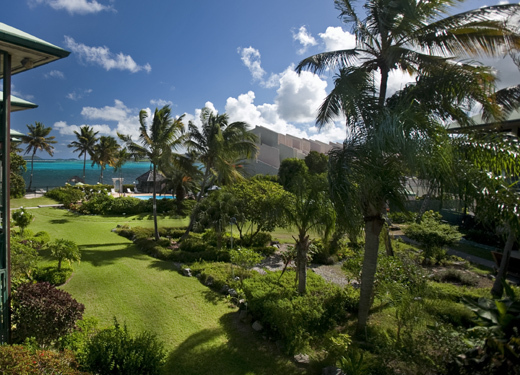 Colony Cove is, without a doubt, the perfect base for a Virgin Island vacation. Golf and duty-free shopping are nearby. A supermarket, bank, convenience store and fast food outlets are an easy walk. Our resort beach features a restaurant with wonderful lunches and dinners that's nearby. Note: No passports are needed for USVI travel (American citizens). For more things to see and do on St. Croix, see our page About St. Croix. Day and half-day adventures inine U.S. and British Virgin Islands. We are right on a great beach, shaded with palms, and with white-gold sand. Our freeform freshwater pool is a great place to relax and splash. There's two lighted tennis courts, a near-by bar and restaurant, and daily maid service. Snorkeling and scuba, windsurfing, sailing (even parasailing), and deep sea fishing can be arranged for your family or group.